Introduction: Labyrinthectomy, although rarely performed, may be a very effective surgical procedure for patients who have peripheral, poorly controlled, poorly compensated, and debilitating, episodic or chronic, vestibular dysfunction such as patients who have failed comprehensive medical management for Meniere's Disease (diuretics, low sodium diet, vestibular suppressants, steroids, intratympanic dexamethasone, chemical labyrinthectomy with intratympanic gentamicin, vestibular rehabilitation, etc.). The optimal patient usually has useful hearing and vestibular function (as measured by ice water caloric testing) in the opposite ear and severe-to-profound hearing loss in the affected ear. 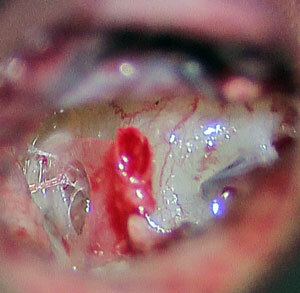 The physiologic rationale for labyrinthectomy is to promote central vestibular compensation. 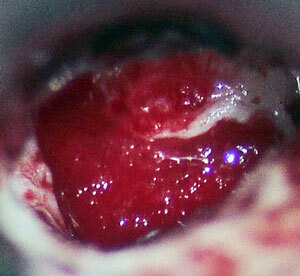 Labyrinthectomy may be performed through a transmastoid or transcanal approach. For patients who are unable to undergo a several hour anesthesia required for a transmastoid approach, a transcanal procedure is preferable as it requires approximately 1 hour to perform. In addition to a shorter operative time, transcanal labyrinthectomy is a more direct approach to the vestibular system, has lower morbidity, less chance for inadvertent facial nerve injury, and less of a probability of cerebrospinal fluid leak. 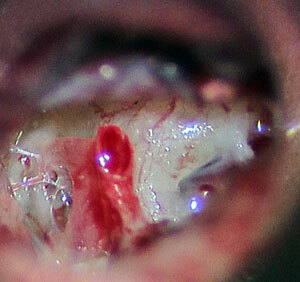 Transcanal labyrinthectomy results vary between 95 and 99% control of vertigo. 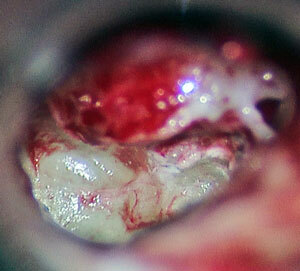 Success depends on a thorough ablation of the entire vestibular end organ and postoperative central compensation. Negative factors for success include, but are not limited to, increased age, visual disturbances, obesity, sedentary lifestyle, severe arthritis, immobility, or underlying psychiatric disorders. 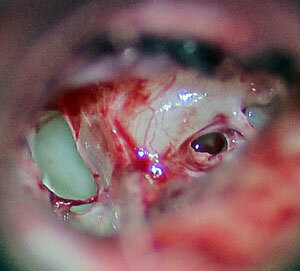 Labyrinthectomy may be performed through either a transcanal or transmastoid surgical approach. 4. 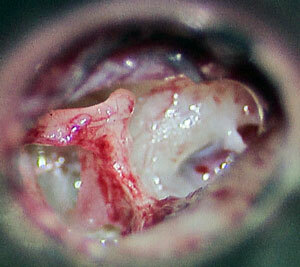 R stapes removed. RW opened. 5. Oval and round windows joined. 6. 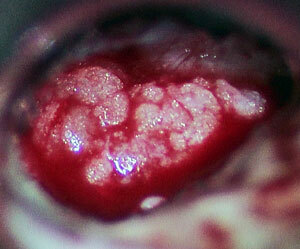 Gelfoam with gentamicin placed. Unsteadiness, nystagmus, vomiting, etc. may occur and needs to be supported postoperatively with IV fluids, etc. For more information concerning transcanal labyrinthectomy, please contact our Nursing Department at 336-273-9932 during normal business hours.